Two articles in the Wall Street Journal from Thursday April 11 (print edition, p. A7) illustrate with remarkable clarity the phenomenon that I have defined as industrial poverty: when a modern industrialized economy is under a heavy enough burden of a welfare state, it grinds to a halt and the standard of living stops increasing. People can only replace, not increase, their standard of living and growing generations have to work harder to achieve that same standard. 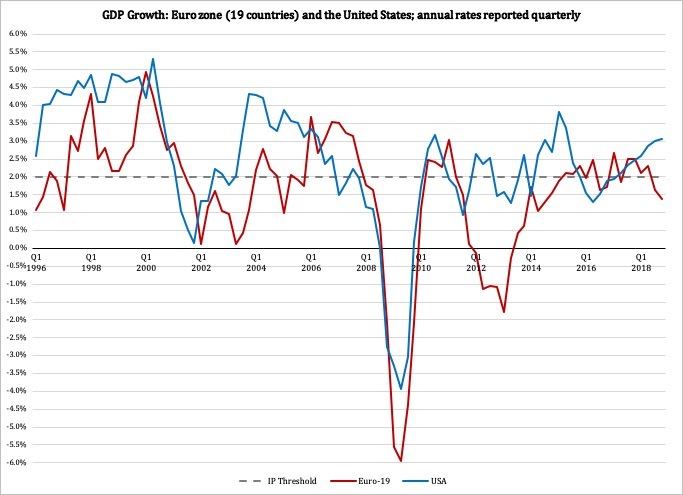 could take fresh action to shore up the eurozone's faltering economy if the outlook darkens, underscoring deepening concerns among policy makers over a slowdown that has dragged on for longer than expected. Starting in 1996, the earliest year for which there is reliable Euro-zone growth data, the U.S. economy has outperformed its European counterpart at almost every turn. Furthermore, as I explained back in August the Europeans get the bulk of their growth not from private consumption as we do, but from exports. What this means, plainly, is that even when their economy is growing it does not generate much room for increases in the standard of living. 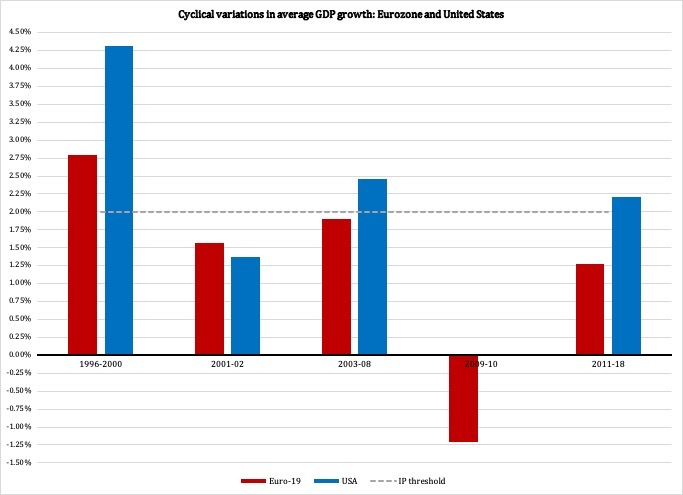 The U.S. economy outperformed the European economy in four of these five periods, suggesting that America still has institutional, legal and regulatory advantages over Europe that continue to give us the economic edge. For one, our government spending is still smaller as share of GDP, which as I explained recently directly contributes to higher growth. said policy makers would consider whether they need to mitigate the impact of the ECB's negative interest rate on eurozone banks - a sign that the ECB might hold rates below zero for some time, and could even cut them further. 4. 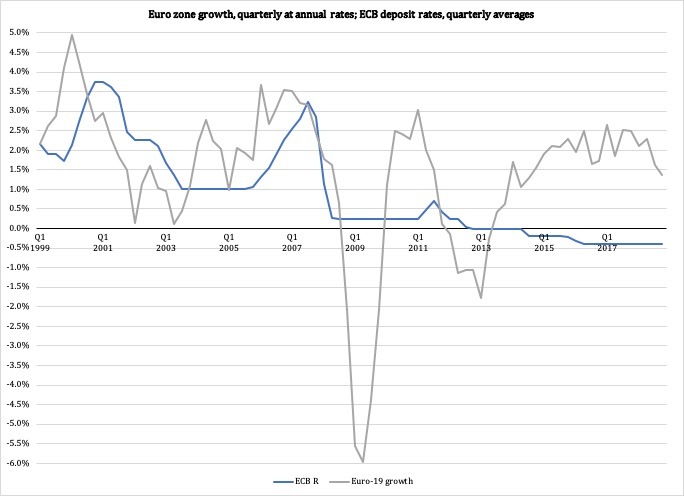 As the Great Recession broke out, the ECB cut its interest rate significantly, and permanently. Since then, monetary policy does not seem to have had any effect on GDP growth; not even negative interest rates can bring GDP growth back to the levels it achieved 15-20 years ago. The middle class is shrinking and its economic power diminishing, in the U.S. and other rich countries, a development that threatens political stability and economic growth, according to a report vy the Organization for economic Cooperation and Development. At the peak of its powers in 1985, the aggregate income of the middle classes was four times that of the richest group. Three decades later, it had fallen to less than three times. While income growth for the middle classes had been slow over that period, the cost of housing, education and health care has risen much more rapidly. The result of that squeeze is that middle-income households have taken on more debt and feel less secure in their status, while younger generations are less likely to gain membership of a group once seen as accessible to all. It is important to note that the concept of the middle class is different in the United States than in Europe. That difference is worth a separate article; the key point here is that once again, an analysis of a macroeconomic phenomenon - the distribution of income - puts its spotlight on the wrong part of the economy. The changes to the attainability of middle-class life in Europe are not, as hinted in the Wall Street Journal article, due to growth in higher-income earnings. The middle class is paying the price of a structurally stagnant economy. When the economy stagnates, people who depend on work for income are less inclined to see advances in earnings than those who depend primarily on equity for their livelihood. The difference between work-based and equity-based income is exacerbated when an economy is flooded with liquidity. Lax monetary policy pours more money into markets for treasuries, stocks, corporate bonds and real estate. This is the case even if monetary policy, as in Europe, is driven by a desire on behalf of the central bank to allow governments to continue spending as if there were no tomorrow. In short: Europe is in a permanent state of economic stagnation, cause by an excessively large welfare state. The middle class pays the price, both in terms of lost opportunities to advance their standard of living, and in terms of increased dependency on an increasingly fiscally stressed welfare state. Their despair is fueled by analytical ineptitude both among economists and in the layers of political leadership. *) This is the growth rate, two percent per year, above which an economy is able to increase its standard of living. Below this level, our average standard of living remains stagnant or declines. For a more elaborate definition, see my book Industrial Poverty (Gower, 2014). **) Exchange rates are determined in part by swings in the interest rate. However, as a general rule only about three percent of swings in interest rate are dependent on trade, which reasonably also means that changes in interest rates that affect the exchange rate have a small effect on trade, and therefore on growth.